My name is Shola. I moved to Calgary recently and it has been a great experience so far. I have a background in Psychology and Human Resources. I love connecting with people, exchanging ideas and learning new perspectives. Feminism, from my perspective, means women being free to make choices, have equal opportunities, enjoy the unique experiences of womanhood and feel comfortable in their uniqueness. What brought you to the Women’s Centre of Calgary? I came to the Women’s Centre for my practicum last semester. It was a unique experience stepping through the doors and observing the open work space set up. Certainly a first for me! I hope to learn more about social issues affecting women in Calgary and also how I can contribute in making a difference. I admire my Mum because she embodies strength, integrity, patience, humility and hard work. I learnt from her valuable life lessons that have helped me through difficult situations. 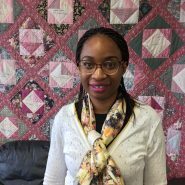 You can contact Shola Adelakun at shola@womenscentrecalgary.org. ← Meet Diane, our new Fund Development Coordinator!